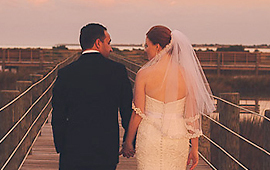 One of the most romantic towns in the United States, St. Augustine is the perfect place to plan and hold your wedding. Start here to plan your perfect day! 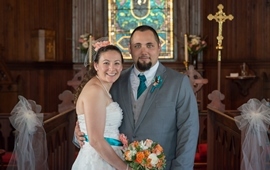 With a variety of scenic locations to choose from for your ceremony and reception and a host of professional, experienced wedding vendors at your service, you can plan and execute the St. Augustine wedding of your dreams using the resources we have listed here. From catering to carriage rides, these listings have your special day covered. Are you looking for a quiet, intimate location to hold your wedding/reception outdoors? Then Genung’s is the place. Located on the Intracoastal just south of the 206 bridge, this scenic spot is perfect for small-sized weddings/receptions! Contact us today for pricing. Looking to add a special touch to your wedding? St. Cyprian's chapel is small and intimate with a touch of elegance. Any denomination, faith, and tradition are welcome. Couples are encouraged to create their own ceremony reflecting who they are. Indoor and outdoor options are also available for your reception for wedding parties of various sizes. Parking is no problem either. Relax and enjoy your picture-perfect wedding day at our award-winning inn, offering the best views in the ancient city. We can host an intimate ceremony for the two of you, or you can rent the entire inn for an even larger celebration. Our romantic gazebo draped with curtains billowing in the breeze or our stunning 2nd floor deck create the perfect atmosphere for your special day. A condo hotel directly on Crescent Beach, makes the option of the 'do-it-yourself' beach wedding easy and affordable. Have your wedding on the beach, an intimate reception in our conference room, and let your guests enjoy the ocean views from our one bedroom ocean front balcony suites. Beacher's Lodge, a beach location the whole wedding party will enjoy. Becoming a church for all generations. Serving St. Augustine since 1881. Located at 8 Carrera Street, St. Augustine, FL 32084. Sunday Worship Services are 7:45am and 11:00am and a 9:15am casual service. Childcare is provided for all services. Adult Sunday School at 9:15am and 10:15am. Office hours are Monday through Friday 9:00am to 3:00pm. For additional information, please visit our website. Weddings on the water...a romantic, memorable location for your special event. The HarborView Room, just minutes away from Downtown St. Augustine, provides a stunning waterfront venue. They offer customized packages, a serene decor, and event professionals to take care of all your needs. You'll feel like a guest at your own wedding. Your Special Day deserves a special location. Celebrate your big day on the beautiful grounds of Florida's most historic location, The Fountain of Youth Archaeological Park. Located on 15 lush acres overlooking the Matanzas River and St. Augustine Inlet, the incredible views will establish the romantic mood. Create lasting, magical memories for you, your family and friends. Book your ceremony today! Your wedding and reception right in the heart of the St. Augustine Historic District? Our beautiful church is a wonderful venue choice and our 6000 square feet reception hall holds a capacity of 300 people, large caterer's kitchen, audio visual services and parking on site. Separate kitchen entrance so not to disrupt your guests. Walk through our doors and begin to unwind. Here luxurious treatments for body and mind create a memorable experience. Take a vacation away from your everyday routine and let our professional staff indulge your senses. From Bridal Packages to a pampering day for yourself, we will meet your every need! For your convenience, open 7 days a week. The Ocean's Edge Room at The Reef offers brides the unique opportunity to have both ceremony and reception in one convenient and beautiful location. Located on Vilano beach and overlooking the Atlantic, Ocean's Edge has two private balconies and can accommodate up to 85 people. With professional staff and original cuisine, The Reef is the perfect place for your dream beach wedding. Great for Wedding Groups and Family Reunions! Looking for a getaway in St. Augustine's historic downtown district? 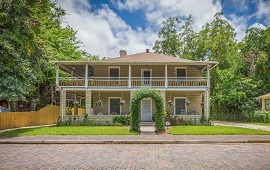 Built in 1910, this completely remodeled home is great for 2 to 24 guests. We offer a great location central to several beaches, attractions, shops, and restaurants. Whatever the reason for your visit, the Oviedo House will ensure you have an enjoyable stay. What bride wouldn't want to ride in a horse drawn carriage on her wedding day. Arrange carriages for the whole wedding party or just a ride for the bride and groom in our Cinderella carriage. We can make your day special! We know that you want everything to be perfect on your wedding day and every element becomes important, including the food. By the time the ceremony is over, your jitters have passed and you are ready to eat after a very full day of events, and so are your guests. Browse menus to find the right caterer to fit your taste and mood. Whether you’re looking for the bridal gown or a suit or tux for him, St. Augustine has a number of stores that specialize in wedding and formal event attire. Whether you decide to have your St. Augustine wedding spur of the moment and need to grab the appropriate attire or you’re just searching for the perfect dress, check out the links below for more on where to find formal wear. Many St. Augustine musicians are available to entertain you and your wedding party during your reception, engagement dinner or other special events associated with your wedding. Take a quick look at what these wonderful area performers can offer to add a unique touch to your special event. 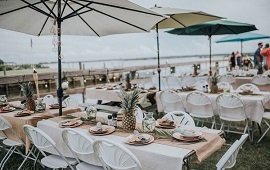 Because of its popularity as a wedding site, the St. Augustine area is home to many professionals who can help make your big day go off without a hitch. From consultants to planners, your level of involvement is entirely up to you. 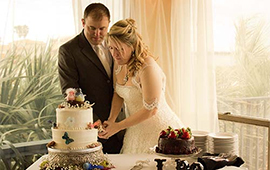 The wedding professionals in St. Augustine are used to both kinds of brides and grooms: those who come fully prepared, and those who decide on a whim to have a small wedding here while on vacation. 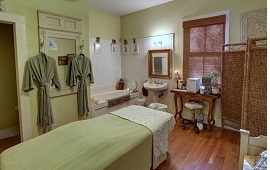 St. Augustine has a variety of salons and spas to help you relax before and after the big day. Whether you’re looking for a full service location to help get your ready for your wedding day or just a place to duck in for a quick massage to escape your to-do lists for a while, one of the vendors below will be able to fix you up and send you off feeling like brand new. Whether your event is two years from now or next weekend, St. Augustine has a beautiful wedding venue to offer you and all of your guests. A grand wedding in a glorious cathedral, a small, intimate wedding on the beach or a dream wedding in a romantic castle: all are options that you can consider for that big day. 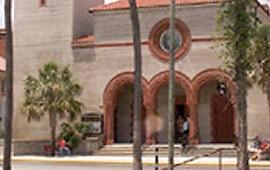 Keep in mind that St. Augustine is a popular wedding site so some venues can be booked months or even years in advance. If you have a specific place in mind, it’s important to plan ahead. Often one of the first things that brides-to-be decide on is what flowers they want to have at their wedding. Fresh flowers make the event more special and add an elegant touch to the decorations. In fact, some people plan their whole decorating scheme around the flowers. Choosing the right florist can make all the difference. Romantic bed and breakfasts, spas, hotels and other accommodations around St. Augustine are almost always running specials for newlyweds. St. Augustine is a popular honeymoon destination, both for its romantic atmosphere and access to so many different activities you can enjoy with your sweetheart. See the links below for some of the honeymoon suites and packages provided by local vendors. You can’t trust just anyone with your wedding photography. Luckily, there are many skilled, artistically sensitive photographers located in St. Augustine that are ready to document your special day. Browse the galleries of the professionals listed below. There are many different angles that you and the photographer can decide upon: from capturing every real, emotional moment in a photo journalistic style to an elegant stylized approach. Don’t forget that wedding videos are just as important as the photos as it can allow you to truly relive the experience on important events such as anniversaries to come, or just when you’re feeling nostalgic. The decision is yours and here are the people that can make it happen. For all of your wedding essentials—from tables and chairs to tents and dance floors—you’ll need to find a local rental facility with a large catalog and experienced staff. St. Augustine has several reputable rental companies who can help with your event, no matter how big or small. Check out some of the information listed below to find the right items for your St. Augustine wedding. From carriages to limousines, your transportation to and from your St. Augustine wedding can be as romantic as the wedding itself. 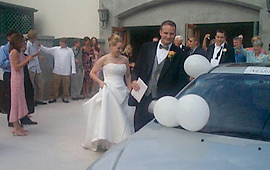 A number of local businesses rent limousines and other luxury vehicles for weddings and special events. 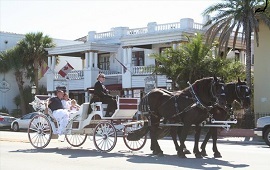 For the ultimate Cinderella moment, rent a horse-drawn carriage for you and your special sweetheart. View our links below for more information on St. Augustine wedding and special event transportation. No wedding is complete without a gorgeous (and delicious) wedding cake! St. Augustine features some of the best bakers and cake decorators in Northeast Florida. Don’t miss the opportunity to browse the gallery of the sites below and drool over the delectable flavor options.